Would adding concrete blocking and shims under the sills help with weight transfer when building a stick built roof with sheathing and shingles over the old crown (or flat) roof? I realize all the new weight is transferred to the outside walls and floors joist to the outside of the beam rails. To avoid a buckle or sag I could block every 8 feet under the sill and then put some new skirting. My local jurisdiction has already issued me a permit. Does this seem like a plan? p.s. I realize that concrete footers & post & beams are the best, but living in a rented park does not allow the digging. You definitely need perimeter blocking to support the weight. You can't fail if you don't try! thank you for a quick response.....would blocking every 8 feet be sufficient? Every 8 feet should suffice. 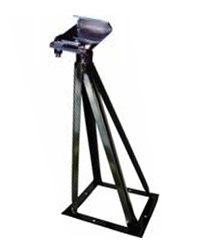 There are also mobile home adjustable steel piers available for less than $20 ea. These would sit on an approved (must have stamped classification) pressure treated pad, which will cost $6 to $8, depending on who you go through. If there any companies in your area doing mobile home set-up, there probably is a local supplier for these piers, unless they are not code compliant in your area. These steel piers are much easier to work with and are adjustable for relevels and such. All information and advice given is for entertainment and informational purposes only. The person doing the work is solely responsible to insure that their work complies with their local building code and OSHA safety regulations. P.S. The pier top is purchased separately. The one in the image is a locking top for the frame. They sell a saddle type for use with 4x4s or rim joists. They cost $3-$4 ea. All prices are retail. Last edited by JD on Fri Aug 03, 2007 12:37 pm, edited 1 time in total. Thanks JD, this looks easier to work with than blocks. Do you know the dimensions of the "pads" or a link where I could see one? Use the following link to their products. Under Support, look at Standard Piers and Wood Pads. There are also ABS pads that are approved here in my area, but I never use them. This company is in the Sacramento, California area. Unless you are near them, you probably would not want to pay for shipping. Again, there should be a company like this in your area. I am in Fresno, CA and there are at least a dozen suppliers within 2 hours. JD thanks so much. Now that you showed me the jack stands, I remember seeing them in another park. Our jurisdiction does allow them and I am within 90 minutes of a supply house. Also, easier on my truck 60-70 concrete blocks! You are welcome. Before you get your pads, establish where they will be located. As Mark said, every 8' should be good. You also want to be sure they land directly under the hinge side of entry doors and the king studs of all large windows and sliding glass doors. Look under your home and see if there are marriage joint piers. They go right where the 2 halves come together. You want to have these to help with the added weight also. Measure the distance from the ground to the rim joists or marriage joint. You want the pad, pier and top to be about one inch lower than this measurement, when the top is screwed all the way down. This gives you some adjustment room. There should be no more than 2" of threads showing on the adjustment piece. People fudge here, but not advisable. If at any time in the future you need to raise a pier top over this 2", you can double pad the pad to stay within the adjustment amount. Just take your exact measurement to the supply place and they will figure it out for you. Remeber where they all go though. I have removed skirting, checked for level (it is) and inspected belly wrap (all in order for this old house). I have checked for steel support jacks as one option JD suggested, but will have to opt for blocking as my support option. Upon inspection underneath, would it make more sense to block at the point where the outriggers meets the sills (plus still remembering Marks advice about doors and windows) using 3 blocks and a heavy duty pressure treated shim? Or should I block in between the outriggers directly under the sill? I would put the piers between the outriggers so the outriggers could offer additional support. Depending on where your outriggers are, they may not center between all piers at 8' o.c. and as you mentioned, under king studs of doors and large windows. Keep in mind that keeping your home level is more important as well as more difficult when you add an extra row of piers. When a single unit is on two rows piers, the home moves freely as it settles. When on three rows of piers, a home can cause a bind or void of support as the home settles. I'll post photos of this project as it begins. Now all I have to do is learn how to post a photo! That might be a harder task for me than doing this roof-over! Posting pics is pretty easy. When you are writing a post, look up to the upper right and you should see an "Upload Picture" button. You have to browse your files to pick the photo you want to post, and on the next window click "Standard". Sometimes you have to page down to see the link "Standard".